Dental Direct has been providing discounts on dental services since 2008. At Dental Direct, we understand the importance of an ongoing dental maintenance plan for yourself and your loved ones. Get 3 years of membership coverage for the price of 2 with our 3-Year Membership Plans. Our 3-Year Individual Membership Plan is a great option for people seeking primary, secondary or supplemental benefits. Sign up with our 3-Year Family Membership Plan and get coverage for up to five family members in your household. 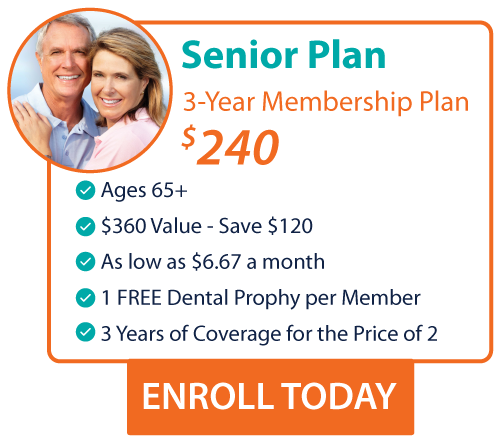 Seniors ages 65 and older can also enjoy the benefits of Dental Direct with our exclusive pricing with the 3-Year Senior Membership Plan. Members can also take advantage of 1 FREE cleaning per member per year. Enroll today and begin using your plan immediately. The benefits of membership with Dental Plans Direct, are fast, easy and endless. At Dental Direct, we understand the importance of affordable healthcare and well-defined oral maintenance dental plans. Dental Direct can be used as a primary dental benefit for individuals, families and seniors. Our Discount plan offers over 150 discounted dental services and is designed to support patients who are looking for an affordable dental coverage option and prefer the benefits of a discount plan to traditional insurance. Patients can use Dental Direct as a primary dental benefits solution when they need a comprehensive treatment plan that they might not otherwise be able to afford. Dental Direct offers a wide network of Providers and the best level of care, whenever care is needed. Choose the affordable dental solution and sign up for Dental Direct today! Dental Direct understands that many primary dental plans include annual limits and caps and therefore patients can be held responsible for any portion of dental bills left unpaid after you’ve reached your policy’s maximum limit. We have good news for you. Patients can use Dental Direct as a Supplemental Benefit plan. This means that Dental Direct can be your affordable solution to denied claims or uncovered services. You can also use the Dental Direct Discount plan to reduce out of pocket expenses not covered by your primary insurance. Our 3-Year Membership Plans will give you 3 years of plan coverage for the price of 2. That’s 1 whole year of coverage FREE! Why wait? Enroll today and take advantage of these exclusive membership fee discounts! Dental Direct knows that some procedures, although necessary, can be very costly. Giving patients affordable options is at the forefront of what we do and who we are as a discounted dental benefits plan. Our dental plans are flexible and can be combined with a patients’ existing insurance coverage to help pay for costly dental procedures. Use Dental Direct as an alternative dental benefit so you can better utilize your existing plan maximums, while getting the care you need, and reducing out of pocket expenses. Our discount dental plan is being used by patients just like you across the nation looking to get the best care from the most respected providers at great discounted prices. 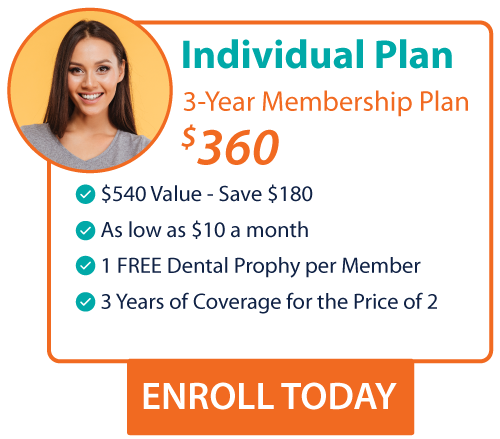 Join Dental Direct today and save 1 year on your dental plan membership fees by enrolling in one of our 3-Year Membership Plans.